Facials can work miracles for your skin; they’re cleansing, relaxing and even anti-ageing. A day at the spa for a professional treatment can be a lovely treat, but it can be quite pricey. Luckily, you can get all the benefits of a professional facial with a home DIY facial, for a fraction of the price tag. 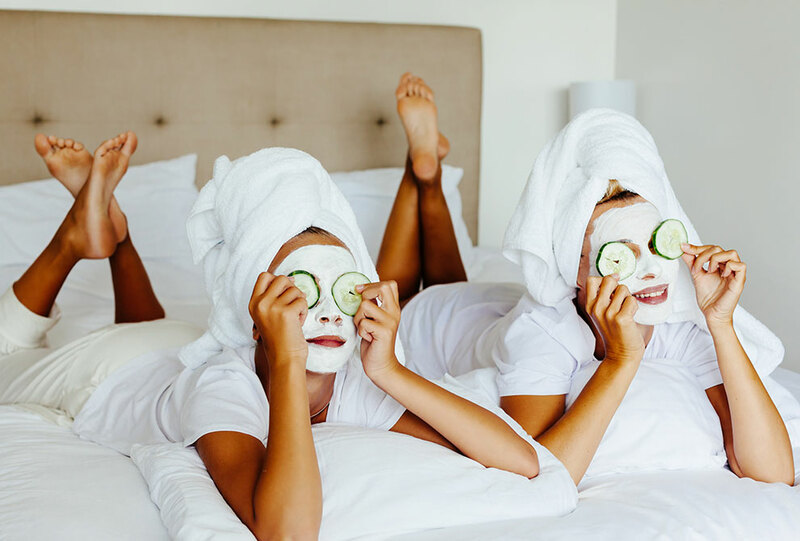 From the correct way to cleanse, to how to properly hydrate your skin, we’ve put together a step-by-step guide on how to do a DIY facial. Follow our home facial tips to enrich your skin and save your bank balance. First, take the time to properly clean your face with a good cleanser. Wash it with lukewarm water and a cream cleanser, such as Elemis Dynamic Resurfacing Facial Wash. Lukewarm water helps lift the dirt out of your skin, but try to avoid water that’s too hot as it can be drying. If you wear a lot of makeup, you might want to use a gel cleanser such as Derma V10 Micellar Cleansing Gel Wash instead to ensure your skin is clean and clear. Next, use a good exfoliating scrub to really treat your skin. Exfoliating is when you remove dead cells from the top layer of your skin, leaving it looking healthy and bright, and helping your other skin care products penetrate deeper into your skin. Apply a product such as St. Ives Blemish Fighting Apricot Scrub to your face, and gently move a washcloth in small, gentle, circular strokes around your face. Then, rinse your face with lukewarm water. If you suffer from acne or regular blemishes, steaming your face is an amazing way to cleanse facial pores and eliminate dirt and debris. It will also help your skin absorb the products you’ll be using again later. Boil two cups of water and once boiled, pour the water into a heatproof basin placed on a heatproof surface. Avoid plastic materials because toxic chemicals might be released by the boiling water. If you feel like pushing the boat out then add a few drops of an oil of your choice from the Kneipp Herbal Bath Oil Collection. Just make sure you don’t add anything whilst the water is boiling or else the aroma will disappear. After all that preparation, it’s time to steam your face. Once the water has cooled slightly, place a towel over your head and lean over the water. Make sure that the towel is big enough to trap the steam and don’t get too close or else you might burn yourself. We recommend you steam for at least 5 minutes to get the benefits, but no longer than 20 in case there are any issues you might be exacerbating. Now it’s time for that all-important face mask. Face masks are great for hydrating your skin, getting rid of oils and improving the appearance of pores. What’s more, you’re spoiled for choice when it comes to masks to try at home. If you’re looking for cheap and cheerful, try the Metallic Easy-Peel Coconut Face Mask or the Anatomicals Hawaii Glow Tropical Hydrating Face Mask. For a little more luxury, invest in Estée Lauder Nutritious Radiant 2 StepTreatment or for even smaller pores, try a charcoal face mask. Alternatively, there are a number of recipes online on how to make your own face mask. Just try to avoid eating the bananas, honey or avocados in the process! Next, it’s time to tone in order to restore your skin’s natural pH levels. The Revlon 24 Hours Gentle Toner or Kaeso Beauty Calming Toner Mulberry & Pomegranate contain a variety of ingredients that’ll help to tone and soften your skin. This is an important part of the process to ensure you have a salon quality treatment, so try not to skip it! You’re almost finished! Now all that’s left is for you to moisturise and hydrate to leave you feeling as fresh as a daisy. The Derma V10 Q10 Innovations Day Cream is formulated to protect the skin against the damaging effects of everyday life. For a tropical twist why not try the Inecto Naturals Coconut Moisture Cream? The organic coconut oil will rehydrate your skin, lock in moisture and leave you smelling good enough to eat. After all the above steps, rehydrating your skin with moisturiser is an incredibly important step, as you will have opened the pores and left it a little more vulnerable than usual. Follow all these steps and you can be guaranteed glowing skin, worthy of the salon! For further skin care advice and information on all things beauty, check out our blog.